Kit is a native New York City girl who has spent over half her life in the Commonwealth and New England. No, she is not a Yankees fan…! 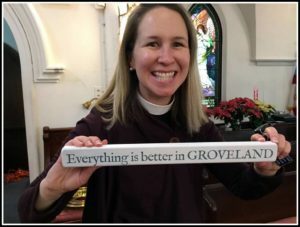 Ordained in 2009, she has served in a variety of ministry positions—as Director of Youth Ministries for the Diocese of Massachusetts, Head Chaplain at the Barbara C. Harris Camp, and most recently as Assistant Rector at Christ Church in Andover, MA. Previously, Kit worked at both St. George’s School in Newport, RI (2005-7) and Northfield Mount Hermon School (2001-2) as a faculty member, dorm parent and sailing coach. She is an alumna of Tufts University (BA), Harvard Divinity School (MDiv) and the General Theological Seminary (post-graduate Anglican Diploma). Kit began this call as Priest in Charge at St. James Church in July 2014 and was installed as Rector on October 4th, 2017. Kit has a passion for inter-generational ministry, welcoming and forming lifelong churchgoers and newcomers to the church alike, and creating engaging worship and liturgy. Outside of her time at St. James, she enjoys traveling widely outside the country, attempting to cook, watching reruns of West Wing, Firefly and classic movies, and dancing around her kitchen with her children and dog to music. Kit’s better half is Chris Kowaleski, and together they have a young daughter, toddler son and rescue chocolate lab, Dosie. Reverend Kit’s office hours are Tuesdays, Wednesdays and Thursdays at St. James, and by appointment.